The classic of practical mysticism is published with four bonus works in this handsome signature edition. Since it first appeared in 1914, The Impersonal Life has touched hundreds of thousands of readers. Its simple meditative message teaches you, step by step, to realize that your own consciousness is one with all of Creation-that you are an outlet of Divine will. Once that extraorinary truth is understood, your wishes become one with God, and your life unfolds in a meaningful, exuberant mosiac in which your fondest hopes and highest purposes are realized. 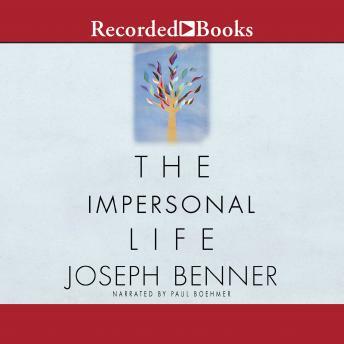 Written anonymously by American mystic Joseph S. Benner (1872-1938), The Impersonal Life is one of the modern landmarks of New Thought and mystical spirituality. As a special bonus, this edition includes four of Benner's most powerful essays: The Way Out; The Way Beyond; Wealth; and The Teacher. Here is a complete journey into the work of a spiritual genuis and practical mystic.